"We’re aware of a very small number of customers who have been in touch regarding this toy, and we regret any confusion or offense to those who may have misinterpreted its sounds," McDonald's said in a statement. 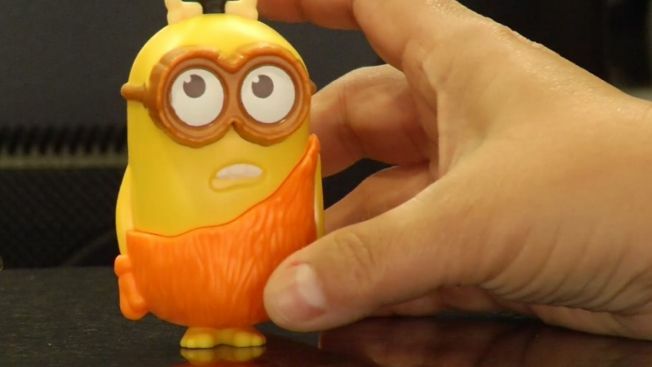 A minion toy in a McDonald’s Happy Meal has some parents, well, a little unhappy. The toy, based on the little yellow rascals that first appeared in “Despicable Me,” says three phrases - all of which are a bit hard to decipher. But some parents hear “what the f---" for one of them, and one angry parent posted a video of it to YouTube. Footage of the allegedly potty-mouthed minion was posted to the video-sharing site Wednesday and some parents think the gibberish sounds a little too similar to a swear word. “Originally we didn’t think anything of it until my wife was moving it out of the car seat and heard something didn’t quite sound right,” YouTube user Paul Butts said in the video. “Seriously? Out of a McDonald’s toy?” he asks after tapping the toy and hearing the phrase. Butts isn’t the only one whose ears perked up. Several parents told NBC affiliate WSFA that they could make out a “cuss word” when they heard the toy speak. Not every parent heard the word, though, with some saying they could only hear the word after they were told to listen for it. Several commenters on YouTube also said they couldn't hear the word. McDonald's said in a statement that the sound is a coincidence. "We’re aware of a very small number of customers who have been in touch regarding this toy, and we regret any confusion or offense to those who may have misinterpreted its sounds. The allegation that this toy is saying anything offensive or profane is not true,” the Oak Brook-based company's spokesperson Lisa McComb told NBC Chicago. "The Minion Caveman Happy Meal toy includes 3 sounds: ‘para la bukay,’ ‘hahaha,’ and ‘eh eh,'" McComb added. "Our goal at McDonald’s is to serve up food and fun for our valued customers, and we’re glad to have the Minions on board." "Minions" stars Sandra Bullock and Jon Hamm, and follows the evolution of the small, yellow creatures since the beginning of time and the numerous despicable masters they've served. The film hits theaters July 10. The parent company of Universal Pictures also owns this site.